Drinking some cheaper supermarket tea blends can push people's fluoride intake over daily recommended levels, and put them at increased risk of skeletal and dental illnesses, a University of Derby study has found. Levels of fluoride found in 38 tea products were compared with each other and to the US National Academy of Sciences' (NAS) daily dietary reference intake in the research by Laura Chan, Professor Aradhana Mehra and Professor Paul Lynch from the University of Derby. The study is published in journal Food Research International. Using Ion Selective Electrode (ISE) analysis - which can analyse trace elements, such as fluoride, in a liquid - of the dry tea, and of the tea infusions brewed with boiling water for two minutes, the researchers compared the fluoride levels ingested by someone drinking the average daily intake of tea (four cups or one litre). Significant differences in fluoride levels were discovered when economy black tea blends from supermarkets Asda, Tesco, Morrisons and Sainsbury's were compared with branded black tea blends such as PG Tips, Twining's, Typhoo; and with green tea blends including Clipper Organic leaf, Green Twining's bags; pure blends such as Assam, Dilmah and Ceylon; and Oolong and Pu'er blends from India and Sri Lanka. 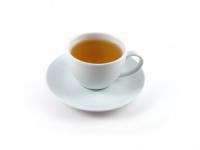 Infusions of economy black tea blends, such as Asda Smartprice, Tesco Value, Morrisons Value, Sainsbury's Basics, and Waitrose Essential, were found to have the highest concentration of fluoride - an average of six milligrammes (mg) per litre. Although, Waitrose Essential was significantly lower in fluoride compared to the other economy black blends. When compared to the NAS daily dietary reference intake of four milligrammes of fluoride per day, these economy blends of tea contained from 75% to 120% of the recommended daily intake. Infusions of green tea blends had the next highest concentrations, followed by branded black blends such as PG Tips, Twining's and Typhoo with an average of 3.3 mg per litre, then pure blends. Oolong and Pu'er teas had the lowest concentrations of fluoride - an average of 0.7 mg/litre or just ten per cent to 16% of the daily reference intake. Laura Chan, who carried out the study for her PhD at the University of Derby, said: "The tea plant, Camellia sinensis, is a fluoride accumulator, with mature leaves accumulating most of the fluoride. "When tea is harvested, these older leaves may be used to produce lower quality, stronger teas such as economy teas, whereas the bud and newer top leaves are used in the manufacture of higher grade and speciality tea products. "Although fluoride is considered an essential micro-nutrient for human health, in the prevention of tooth decay and promotion of healthy bone growth, excess fluoride in the diet can have detrimental effects. Dental fluorosis, the mottling of tooth enamel, and skeletal fluorosis, pain and damage to bones and joints through calcification, can occur. "People may be drinking excessive volumes of tea in addition to other dietary sources of fluoride and may not realise these potential health implications. Indeed, there have been cases, in both the UK and the USA, of skeletal fluorosis in individuals who drank more than the average amount of economy tea." added Ms Chan. "All tea products should be considered as a main source of fluoride in the diet, and we would urge supermarkets and manufacturers of tea to consider stating fluoride concentration as part of the nutritional information found on food packaging." That is one painful font. Since the fed gov't believes that fluoride is an essential nutrient, then rather than add artificial fluoride waste product to public drinking water, why not just tell people to drink more cheap tea?